I know the publisher reserved 25 books for the book signing on October 5, 2013, at 1:00pm, at William and Grace. When those are gone-our stock will be depleted. However, we are planning to reprint as soon as possible. If you would like to reserve a copy of My Days with Nell, and will miss the opportunity to come by William and Grace on October 5th, just email me and I will place your name on a waiting list. I will do my best to see that you receive a book. I am grateful to everyone for the kind remarks and encouragement shown to me during the launch and sales of our book. It has surpassed my wildest dreams and I am so thankful to each one of you that purchased a book. Who said, "You can't go home again!"? Well for me, it just wasn't true today! I had the honor and privilege of visiting West Marion Elementary School for an "Author Day". What a blessed event! I felt so loved and welcomed by my school family. Students in grades 2 through 6 were respectful, attentive and made me feel so special. They asked wonderful questions and amazed me with their excellent behavior during my presentation of the writing process. The faculty and staff at West Marion are so sweet and I loved reconnecting with so many of my former co-workers and friends. A special "thank you" to Mrs. Kirkpatrick, Principal, for allowing me to visit. Also, I want to express my deep appreciation to Mrs. Ashley Greene, Media Coordinator, Mrs. Nancy Talbert, Physical Education, and Mr. Benjamin Moore, Music, for staying with me all day, encouraging me and supporting my visit. They are exceptional educators and I love them all dearly. And just when I thought my day could not be any better, I was presented with flowers during my last class. They were beautiful and touched my heart deeply. It was a remarkable day for me - one that I will never forget. Thank you West Marion Elementary! Well.... all i can say is what a great afternoon at the library! Honestly, I have never met nicer and more professional personnel than the staff at the McDowell County Library. I was welcomed with open arms and Ms. House and Ms. Berryhill could not have been more attentive and helpful. We had several sweet folks drop by to have their previously purchased books signed, which was nice. Then we met several new friends who purchased books from us. I was joined today by my dear friend and illustrator of "My Days with Nell", Virginia Palmer. She is a true master of her craft- so talented and what a blessing it has been for me to share this journey with her. All in all, my experience could not have been more positive. McDowell County residents are very fortunate to have such a caring and competent staff that serves in our public library. Thank you, sweet friends, for making my first book signing so successful and a day I will always remember! 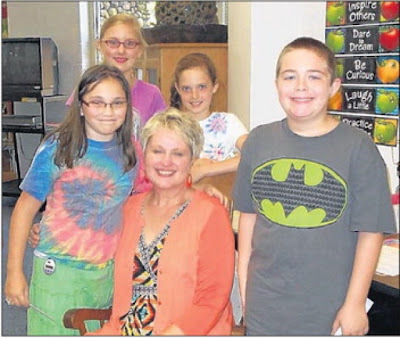 Local author Victoria S. Blake (center) recently visited North Cove Elementary. During her visit, Blake shared her book “My Days with Nell” with students in grades two through six. She also spoke to students about the writing process. Students Alex Jordan, Bobbie Taylor, Mackenzie Burnette and Russell Bentley got their pictures made with Mrs. Blake during her visit. 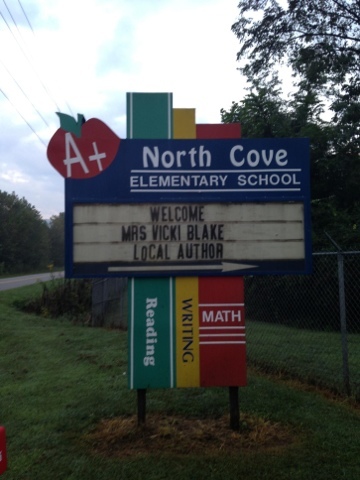 What a wonderful experience I had at my very first Author's Day!I had the pleasure of spending the day with the most respectful, kind and very attentive students at North Cove Elementary! Thank you Mrs. Hamby and Mrs. Jackson and all the faculty, staff and students for making me feel so special! It's a day I will always remember! 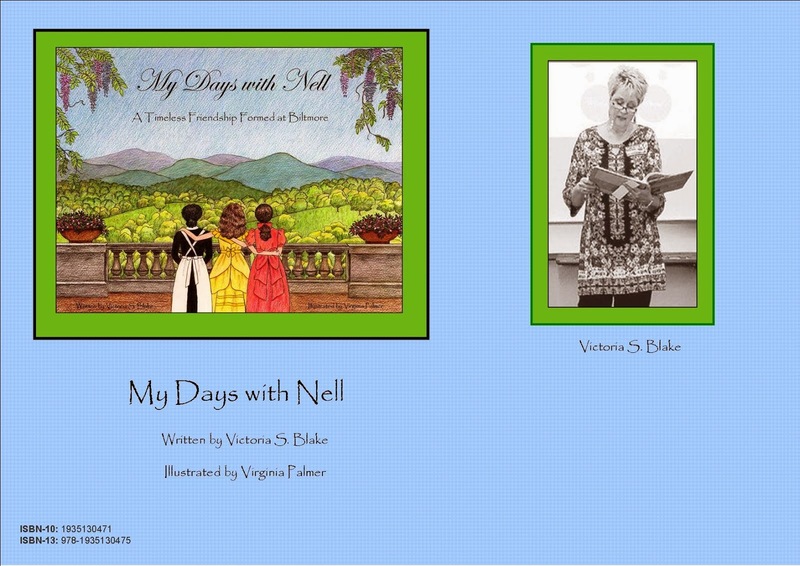 Asheville Citizen Article for "My Days with Nell"
ASHEVILLE – Only the first 500 buyers of Grateful Steps’ new children’s book, “My Days with Nell,” will get the collectible cover depicting the front of the Biltmore House . The book, by Western North Carolina writer Victoria S. Blake, is a story about Cornelia "Nell" Vanderbilt and her best friend, “Lilly,” and it’s set at and around the Biltmore Estate in the early 1900s. Illustrations by Virginia Palmer bring to life the main character, Lilly Staton. Biltmore Estate, which owns all rights to reproduce images of the Biltmore House, has generously given the Asheville-based Grateful Steps Publishing House permission for the home to appear on just the first 500 books printed. In the book, Lilly and her parents travel to Asheville to receive treatment for Lilly, who has tuberculosis. Cornelia, the only child of George and Edith Vanderbilt, befriends the girl. The two friends are soon joined by Ellen Jorith, an African-American child. North Cove Elementary School Author Day! West Marion Elementary School Author Day! I'm so excited to be sharing the writing and publishing process for "My Days with Nell" with the faculty, staff and students of West Marion Elementary School. September 26, 2013, is the date for my "Author Day" at WMES. A huge "THANK YOU" to Mrs. Ashley Greene, Media Coordinator for her assistance in scheduling and facilitating this special day. I can't wait to see some old dear friends and make some new ones with my school family.